Whether you’re going for a hike, on a road trip, or just want to stay energized between meals, make these gluten-free trail mix bars using Mary’s Gone Crackers Sea Salt Pretzels. These healthy pretzels are made from whole grains that includes brown rice, quinoa, amaranth and millet and they also contain nutritious seeds including flax, sesame and chia seeds. 2. Lightly coat a 9 x 13 pan with an organic nonstick cooking spray. 3. In a double broiler, melt 1 cup chocolate chips and pour evenly into the pan to create a chocolate base. 4. In a large bowl, combine pretzel pieces, quinoa flakes, cranberries, sunflower seeds, almonds, brown rice flour, almond flour and yogurt. 5. Melt palm oil in a small saucepan over medium-high heat. Add sunflower seed butter, palm sugar, honey and vanilla. Stir until smooth. 6. Pour palm mixture into the dry pretzel mixture and stir quickly to thoroughly coat. 7. Transfer mixture to prepared baking pan and press firmly and evenly. 8. Bake until lightly browned, which is about 12-15 minutes. 9. 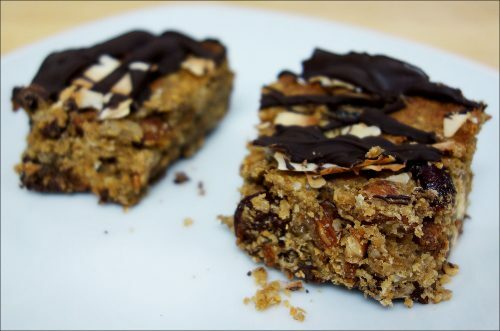 After baking, immediately sprinkle toasted coconut flakes over bars. 10. Melt remaining 3/4 cup of chocolate and drizzle over bars. 11. Let the bars cool completely in pan on a wire rack in the refrigerator before cutting into bars. 12. Keep bars refrigerated since they contain yogurt.